Have you ever dreamed of becoming a pilot and being able to fly a plane? Perhaps you even delight in making and flying paper airplanes or small model planes. 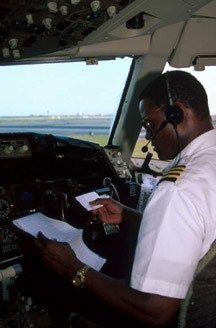 There are many things a pilot needs to know in order to fly safely to a destination. One of the most important is weather conditions. There are many sophisticated instruments to help us predict if a storm may be headed near a plane's flight path. Nature can also help provide some clues. Perhaps you have seen clouds that are looking darker and know that they usually mean a storm is brewing. Perhaps you dream about being able to fly a plane. There are about 2,000 lightning storms around the world going on right now. In fact it has been estimated that lightning strikes the Earth about 100 times every second. Lightning can be very dangerous to property and people. It can start fires, destroy computers, and other electronic equipment. Every year about 200 people in the United States die after being struck by lightning or from the fires it causes. Is lightning a threat to airline passengers? 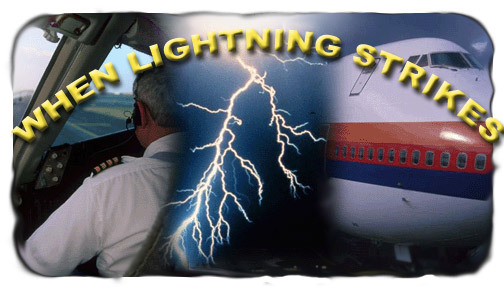 Use the information, resources, and activities here to learn more about lightning and how it impacts flight. [K-4] Content Standard B: Light, heat, electricity, and magnetism. [5-8] Content Standard B: Transfer of energy. [5-8] Content Standard D: Structure of the Earth system. [5-8] Content Standard F: Natural hazards. [3-5] Measurement Standard: Understand measurable attributes of objects and the units, systems, and processes of measurement.